Local Riders,Local Races: Dorset Miles: Quality Sunshine! 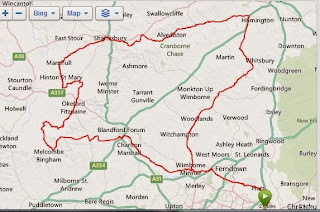 A well ridden route out to Wimborne, Cranborne and Rockbourne, some were heading off road, some were taking an easy day others were already racing, and it was a solitary ride up the Ebble valley. LSD, Long Steady Distance, all the way to Shaftesbury but if you are serious about performance then the emphasis is switching from quantity to quality. Two hours at sweetspot will provide better condition than 6 hours of plodding, there is a reason we prefer the longer rides, we can kid ourselves we have worked hard. Those that deal with this dilemma are those that will progress! Sturminster Newton, Okeford Fitzpaine and the shadow of Bulbarrow, Hazelbury Bryan, Higher Ansty and the easy way up the hill. Dog walkers say hello, the more earnest with their ski poles and big boots smile, the life affirming effect of the Sun! Fast down to Hedge End, Stickland and over to Blandford. I took a punt on Langton Long & the Cowgrove, a bit wet but a good gamble. There are only two wheels that can puncture riding solo but the downside is you are always on the front and I can feel it now. Six hours and three figures on the Garmin, flood tourists & rubberneckers were clogging the roads, the man with the hammer was knocking at the door, the kettle was on and it was good to be home.